Folks sometimes ask why timber framers place an evergreen bough on the peak of the frame after a raising. The short answer--tradition. But I'll take a stab at the long answer, since there isn't much information out there about this tradition. 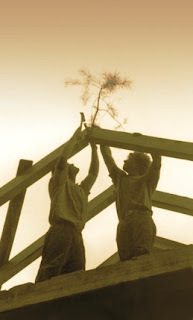 "Topping off" a new frame is a practice that has been around for hundreds of years. It's the act of placing a bough on the highest peak of a newly completed frame. The bough is always an evergreen. I have used pine, cedar, magnolia, and even a discarded Christmas tree. Ask ten timber framers about topping off the frame and you'll get ten slightly different answers. But the common thread is that the whetting bush is placed as a symbol of thanksgiving and respect. Some say it gives thanks to the forest for providing timber for a new home. Some say it gives thanks for a safe raising. A few simply say it's "good luck." Whatever their beliefs are, topping off the frame is a special time for each person. For the folks starting life in a new home, it can be almost like a dedication ceremony. For the carpenters who built the frame, it's a chance to stand back and see the fruit of their labor. For everyone present, it's a moment of celebration. For me personally, placing a whetting bush is a chance to stop and smell the roses. Finishing a job well done is satisfying on a basic human level. Then there's the appreciation I feel for my trade and my fellow carpenters, and the thankfulness I feel for a safe raising and for our renewable resource of timber. 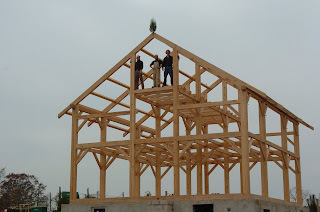 This entry was posted at Wednesday, November 26, 2008 and is filed under timber frame raising . You can follow any responses to this entry through the comments feed . All timber frames in those pictures are so fascinating. All of it looks so strong and you can see that the frames are perfectly placed. 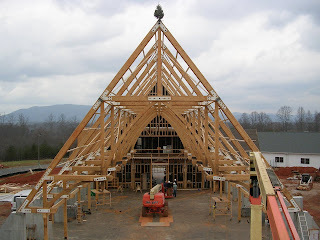 Just found your blog and I have to say I love timber framing. I am very tempted to leave IT and go build barns. I live in Germany and placing a small tree or wreath at the top of a house, before the roofing goes on, is part of the "Richtfest" or building festival. Usually, the carpenters get the "Bauherr" or building owner up on to the roof to drive the last nail and give a speach or say a prayer. The whole neighborhood is usually invited to watch and enjoy a BBQ afterwards.